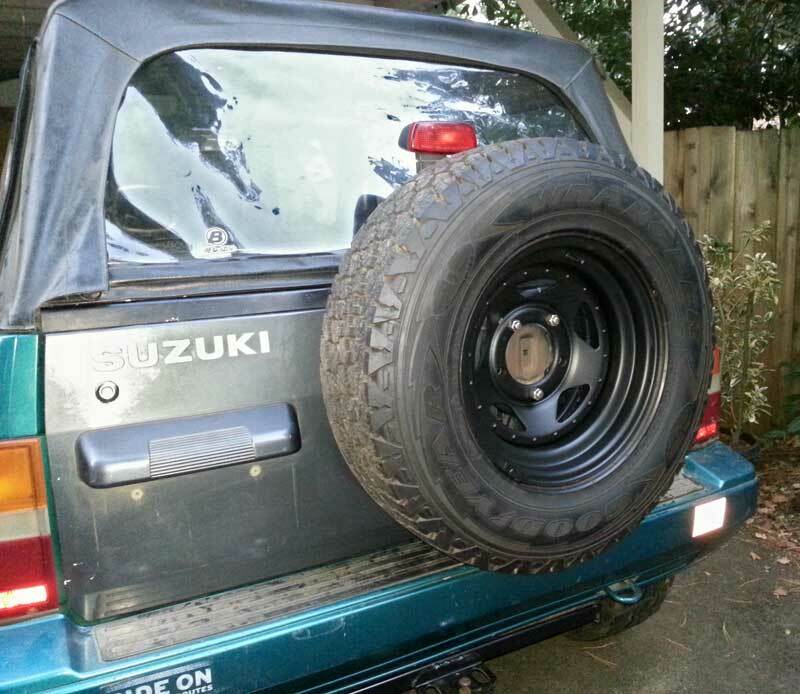 Remember my blingy rear spare tire I had? That chrome-plated five-spoke sparkler which no longer matched my other black wheels? Well it's gone thanks to a can of Plasti Dip. What is Plasti Dip you ask? It's a rubberized coating that can be applied like spray paint to, well, just about anything. 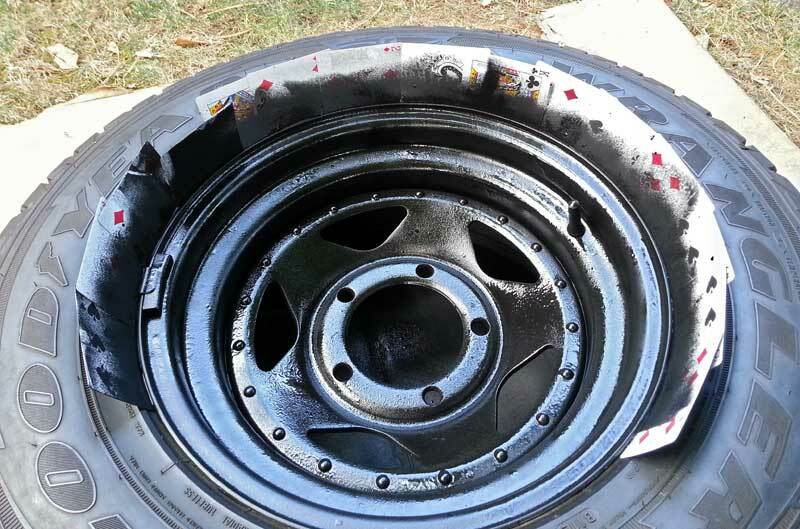 I applied a few coats of it to my chrome wheel, allowing about 30 minutes between coatings. I used some playing cars as a masking device so as not to coat the tire. Although when you apply it, the finish initially looks bumpy, much like bad orange peel paint, it tightens up when it dries and leaves a smooth matte finish. I'm quite impressed with it. The cool think about Plasti Dip is that if you don't like it any more, once dry, you can simply peel it off. It doesn't leave too much (if any) residue, either. It's pretty cool stuff. In fact, I'm tempted to do more parts of my car. Plus, it's available in a bunch of colors. Hmm ... maybe the "Teal Terror" won't remain teal? Also, you may have noticed that the Teal Terror now has a mismatched gray tailgate. That's because the original teal tailgate had developed some cracks and even a small hole and was making a hell of a lot of racket on the road. Luckily, I was able to purchase a used tailgate from a friend. This one is not cracked, doesn't rattle or squeak, but is unfortunately not the same color. It didn't have the provision for a third brake light ether, so I had to drill a hole for it and swap over the rear light wiring. Pretty simple stuff, really. Now I just need to find another passenger door—one that isn't damaged and doesn't make the crazy amount of wind noise the current one does. Mine was hyperextended at some point and doesn't fit that well. A new one would be great. Hell, I don't even care what color it is—I might just Plasti Dip the whole damn truck! Indeed! Plasti Dip. The next best thing since sliced bread. 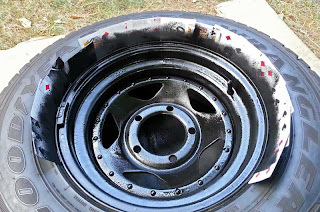 Want to see just how far you can go with Plasti-Dip?